In 1664 there was a renewed threat of a maritime war between the Netherlands and her trade rival England. The Company decided to replace the old fort by a new fortification, which would be effective against attack by European enemies. The site for this fortification, the Castle, was selected in August, 1665, by the Commissioner, Isbrand Goske, who decided “after many deliberations . . . that the new royal fortress which the Lords Masters conceive of, will be laid out on a suitable level site about 60 roods (that is, Rhineland roods or about 223 metres) further eastwards from the fort.” Before the end of that month Rendrik Lacus, the surveyor and fiscal, assisted by the engineer, Pieter Dombaer, had measured out the new fortification. This fortification was built in accordance with the principles of the old Netherlands defence system, which had been adopted in the Netherlands Republic and its extra European settlements since the beginning of the seventeenth century. 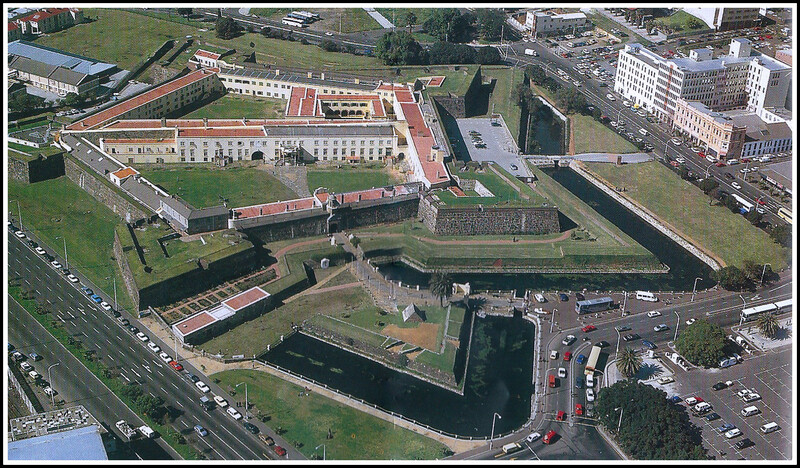 It was to be a pentagonal fortification with bastions at each corner – the shape it still retains to this day. Each wall or courtine between bastions was to be 150 metres long, and the flank of each bastion was to be at right angles to the adjacent courtine so that the flank of a particular bastion commanded the adjacent walls as well as the flank of the bastion opposite. Under each bastion there was to be a powder magazine. A 25-metre moat was also dug round the Castle. The vegetation to the east of the fort site was cut down, and foundations three metres wide and three to six metres deep were laid on bedrock. On 2nd January 1666, Governor Zacharias Wagenaar and others laid four corner stones with great ceremony. Slaves were used to obtain building materials such as stone, lime burnt from shells from Robben Island and timber from Hout Bay, while soldiers did the actual building. When the war came to an end in 1667, two bastions had been completed and the work was stopped. Hoever, hostilities between Holland and England broke out again 1672, whereupon work on the Castle was immediately resumed. By 1674 the old fort could be evacuated and the Castle was occupied for the first time, although it was not completed until 26th April 1679. At this stage the five bastions were named after the titles of the Prince of Orange. The northern bastion, now nearest to the railway lines, was called Buren and contained the quarters of some of the officers and men. On top of the bastion, 12, 18- and 24-pounder cannon were mounted; there were altogether about a hundred such cannon in the Castle during the eighteenth century. Also on Buren was the garden in which Lady Anne Barnard strolled in the days of Lord Macartney (1797-1798) and just outside, against the w\all, there was a tollgate in the time of the Dutch East India Company which everyone coming to Cape Town with produce from the interior had to use. The eastern bastion is named Katzenellenbogen. 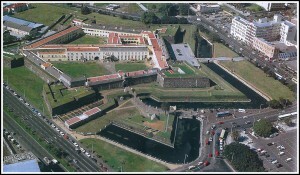 Here the tricolour flag was flown, and below, it was the “black hole” and other cells where prisoners were incarcerated. The southeastern bastion is Nassau, with its own grouping of storerooms and offices. The southern bastion is Oranje. The guards of the armoury were housed here and it also contained the quarters and workshops of the gunsmiths. Between the Nassau and the Katzenellenbogen bastions there was a sally port with iron doors. Up to 1682 the entrance to the Castle was situated between the Buren and Katzenellenbogen bastions, that is, facing the sea. Simon van der Stel was instructed to move it to the “Curtain” between Buren and Leerdam, where it is now. The bell-tower above the entrance is made of “klompies”-bricks, and the original bell, cast in Amsterdam in 1697, still hangs in it. The pediment above the entrance bears the coat-of-arms of the United Netherlands and on both ends of the architrave below them the coat-of-arms of Amsterdam, Rotterdam, Delft, Zeeland, Roorn and Enkhuizen: towns in which the various Chambers which constituted the Company, were situated. Not only did buildings adjoin the bastions and the walls inside the castle, but on the instructions of Commissioner van Rheede, a wall, known as the Kat was built, jutting out from the Katzenellenbogen over the courtyard to a point midway between the Leerdam and the Oranje bastions, together with a gate, connecting the outer court to the inner court or wapenplaats. The old sundial can still be seen above. Other buildings were soon erected on both sides of the 12 metres high wall. To the right of the gateway were the Governor’s residence and a large council hall, completed in 1695, which was also used as a church until 1704. Later it became Lady Anne Barnard’s reception hall. It is now fully restored. The covered stoep of the Governor’s residence, with its fluted kiaat pillars, its graceful wrought-iron railings, its staircase rails with brass knobs, its balcony decorations and the carved fanlight above the front door, is a striking example of the joint efforts of the sculptor Anton Anreith and the architect Louis Thibault. Anreith’s workshop in the Castle stood at the junction of the transverse wall and the outer wall between the Leerdam and the Oranje bastions. To the left of the gateway was the residence of the Secunde, and under it were the grain cellars, which were also built by Simon van der Stel. The outer court contained most of the government offices and also the house of the captain of the military forces. The captain’s tower, from which a watch could be kept on the sea, still stands unchanged between the Leerdam and the Oranje bastions. The Castle had its own well, which still exists, and in Company times there was a pyramid of cannon balls in every courtyard, conveniently stacked for any eventuality. However, as early as the seventeenth century it was realised that the Castle could not be readily defended against an enemy who, after landing, occupied Devil’s Peak. Consequently many supplementary fortifications were erected along the beach, outside the walls of the Castle, and forts high up Devil’s Peak. From 1674 to 1795 the Castle, was the headquarters of the government of the Dutch East India Company at the Cape. It was the official residence of the Governor, and during the first half of the 19th century the British governors used it for the same purpose. When the British Governors went to live permanently in Government House, the Castle continued to serve as the military headquarters and the seat of the government and civil service, but during the 19th century the government departments were gradually removed so that only the military services remained. In 1917 the Imperial Forces handed over the Castle to the Defence Force of the Union of South Africa.